October 20, 2010: Amazon.com has awarded the University of Rochester/Three Percent website a $25,000 grant in support of the 2011 Best Translated Book Awards. This grant will support $5,000 cash prizes for both the winning translators and authors. Launched by Three Percent (http://www.rochester.edu/threepercent) in 2007, the Best Translated Book Awards aim to bring attention to the best original works of international fiction and poetry published in the U.S. during the previous year. Judges base their decision on both the quality of the original work and the quality of the English translation. Until this year, however, the award carried no cash prize. “Over the past few years, the awards have grown in stature, and the introduction of a cash prize for the winners will greatly enhance the reputation and reach of the award,” said Chad W. Post, director of Open Letter Books and Three Percent. On January 27, 2011, the twenty-five-title fiction longlist will be announced on the Three Percent and Best Translated Book Award (http://www.besttranslatedbook.org) websites, and over the following month each title will be individually highlighted through short write-ups by the various judges. The ten-title shortlists for both fiction and poetry will be announced on March 24th, and the winning titles will be celebrated at a special reception during the PEN World Voices Festival at the end of April. Recent winners for fiction include Tranquility by Attila Bartis, translated from the Hungarian by Imre Goldstein (Archipelago), and The Confessions of Noa Weber by Gail Hareven, translated from the Hebrew by Dalya Bilu (Melville House). In poetry, The Russian Version by Elena Fanailova, translated from the Russian by Genya Turovskaya and Stephanie Sandler (Ugly Duckling), received the award in 2010, and For the Fighting Spirit of the Walnut by Takashi Hiraide, translated from the Japanese by Sawako Nakayasu (New Directions), received the award in 2009. 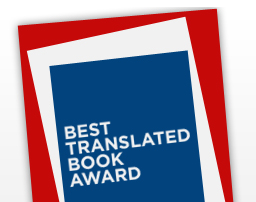 Information about how to submit a title for the 2011 Best Translated Book Awards can be found on the BTBA website (http://www.besttranslatedbook.org). In addition to sponsoring the Best Translated Book Awards, Amazon.com has awarded grants to a diverse range of not-for-profit author and publisher groups dedicated to fostering the creation, discussion, and publication of new writing and new voices, including Ledig House, Milkweed Editions, Copper Canyon Press, Open Letter, Archipelago Books, PEN American Center, Words Without Borders, and the Center for the Art of Translation, all of which are committed to the international exchange of literature and the work of translators.